Book talk: You may think you know the stories of Cinderella, Snow White, Sleeping Beauty, and Rapunzel but don't believe everything a bard tells you. And what about those nameless Princes Charming? Read this book to get the low-down: the pampered, sheltered life was not enough for Cinderella. Rapunzel saved herself and her prince never lived it down. Sleeping Beauty is a spoiled brat. Snow White's prince can't be left unsupervised. Somehow this unlikely band finds themselves thrown together on a quest to save each other, defeat an evil witch, and show the world that they're more than their stories. Rave: This book is a hilarious take on classic fairy tales. Having the various Princes Charming meet and lament over their plight at being looked over for their princesses adds a fun twist. Each have very distinct personalities and watching them interact and learn to get along is both entertaining and touching. It contains a lot of great lessons ranging from how to be a good friend to how to be true to your self. I particularly appreciate that there's male characters who are hopeless with swords and fierce female fighters and vice versa. I read this out loud to my 3rd graders and they loved it! The illustrations throughout only add to the already ample humor and had my kids cracking up all on their own. Rant: There are a lot of characters and this can bog down the plot a bit. It takes a while just to introduce everyone and even then my kids needed clarification sometimes to keep everyone straight. Every Book its Reader: I'd give this to students 3rd grade and up looking for a funny fractured fairy tale. 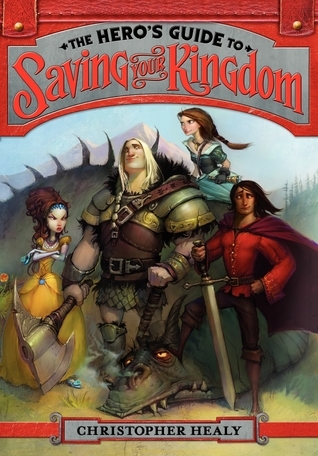 The Hero's Guide to Saving Your Kingdom by Christopher Healy: buy it or check it out today!